Undeniably, New Zealand’s economy is going through a soft patch, with growth disappointing in recent quarters as tanking business confidence held back investment. 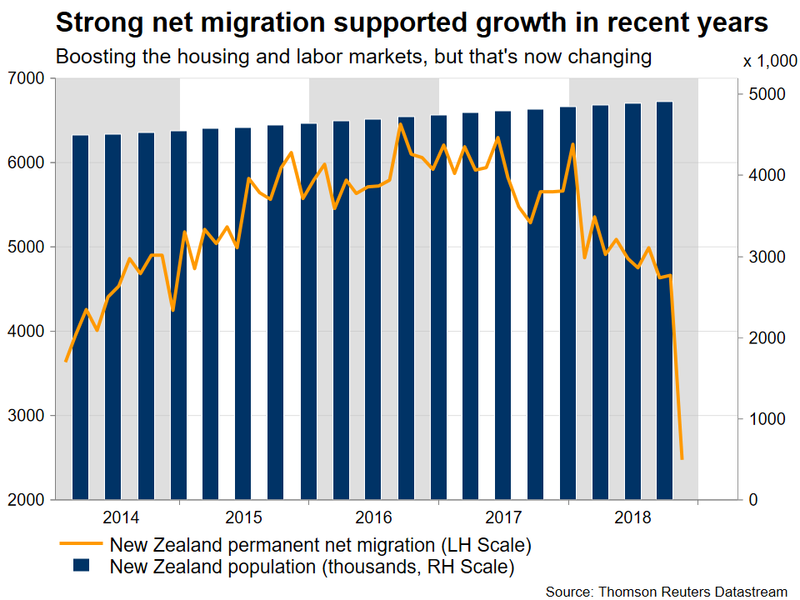 Meanwhile, net migration has started to slow massively, which is worrisome as this had been a major driving force behind gains in the housing and labor markets in recent years, thereby fueling consumption and broader growth. Accordingly, some “cracks” are starting to show in the labor market, with the latest employment report being on the soft side. Of course, there’s an array of external risks as well, with trade tensions and slowing growth in China being the most prominent. 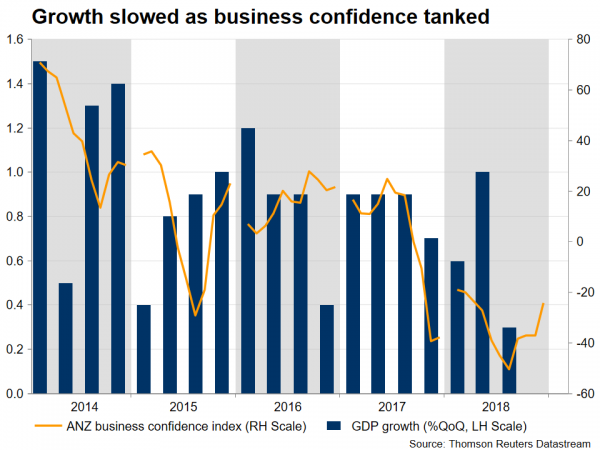 Hence, the RBNZ could very well strike a more cautious tone at this policy meeting, highlighting that downside risks have intensified and keeping the door wide open for a future rate cut. Having said that though, a quarter-point rate cut this year is already priced in with an 85% probability, which implies markets believe this is practically a done deal. Even though this may well happen later on, it’s probably much too early for the RBNZ to commit to such a move, suggesting that the Bank will likely find it difficult to live up to the market’s overly dovish expectations. In other words, given just how dovish market pricing is, anything short of a clear-cut signal that rates will be cut soon could come as a hawkish surprise, and may therefore elicit a positive reaction in the kiwi as investors start second-guessing whether a cut will indeed materialize. A parallel could be drawn with a “sell the rumor, buy the fact” move, considering that the kiwi has recently been under selling pressure as rate-cut expectations grew. Looking beyond this meeting, though, the broader outlook for the kiwi remains bleak. The nation’s data pulse is weakening, slowing population growth amplifies the downside risks around consumption, and foreign developments – particularly in China – threaten the domestic outlook. To be sure, the currency has been kept afloat by surging dairy prices lately, despite these risks. However, dairy auctions tend to be highly volatile and since we’ve already seen robust gains in recent months, a correction may well be due going forward, which could erode one of the kiwi’s biggest sources of support. Technically, initial resistance to advances in kiwi/dollar may be found near the 200-day simple moving average (SMA), currently at 0.6753. An upside break could open the way for the 50-day SMA at 0.6788, with even steeper advances aiming for a test of 0.6820, the swing low on January 30.